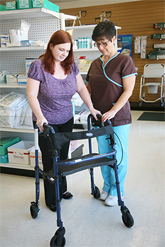 For more than 25 years, Salem Home Medical has provided home health equipment and supplies to area residents as a service of Salem Regional Medical Center. Whether you are recovering from surgery, an injury or are managing a chronic health condition, we have a variety of products and services to help you live independently in the comfort of your home. For your convenience, we provide free home delivery, equipment set-up/instruction, and billing services. Many products are available for rent or purchase, depending upon your individual needs. In addition to home medical products, Salem Home Medical offers a full line of medical professional apparel and shoes through The Uniform Shoppe. Salem Home Medical is located at 2235 East Pershing Street in Salem, behind Salem Regional Medical Center's main campus. Please call us at 330-337-9922 or toll-free at (800) 923-9922 for more information. Our regular business hours are Monday - Friday, 9 a.m. - 5:30 p.m., and Saturday, 9 a.m. - 1 p.m. If your equipment is not functioning properly and you need assistance after hours, you may reach us through Salem Regional Medical Center's switchboard, by calling 1-800-589-5115.